Right now, I’m at the center of the poker universe. With 35 or so World Series of Poker (WSOP) tournaments currently being played out over six weeks (June 3 to July 15) at the Rio Hotel in Las Vegas, practically all the great players in the world are here trying to win bracelets. As I mentioned in a recent column, there are also plenty of wannabes here, too — and this is a wonderful thing. Some, like 2005 WSOP champion Greg Raymer, who picked up $5 million, will become rich and famous; others will find the road to poker riches too hard to handle. My longtime pals T.J. Cloutier and John Bonetti (“Bono”), a couple of “old lions,” are here and showing the “young guns” a trick or two. A few days after Bono’s 77th birthday, he made the final table of the $5,000 buy-in no-limit Hold’em, along with 65-year-old Cloutier. (Both lions will be at my fantasy camp in August; have a look at CampHellmuth.com). When Cloutier and Bono made it to the final three at that table H — along with unknown Steven Zoine — with $650,000 for first, $350,000 for second, $175,000 for third, ESPN coverage and poker history hanging in the balance (Bono hoped to become the oldest WSOP bracelet-winner ever, and Cloutier was trying to win this one and move into second place on the all-time money list by passing me), the game was on! After about an hour of sparring, with the blinds now at $6,000-$12,000, and a $2,000 ante — it happened in a flash. Cloutier opened for $30,000 with Q-Q, Bono quickly made it $106,000 to go with A-K, Cloutier just as quickly reraised all-in, and Bonetti immediately called. It was a hand that played out at hyperspeed, driven by two guys who have been around the block a few times. It’s natural for both of them to move all-in here (with these hands, especially with three players remaining), but they sure didn’t waste any time about it! In poker we call Q-Q vs. A-K the “Classic Hand,” and many tournaments have been won or lost under this scenario. It happens that the queens are about a 13-to-10 favorite pre-flop to win the pot in such a hand, but you might as well flip a coin. Bono was all-in, technically, but Cloutier was effectively all-in as well. One of them would have about $1 million in chips, a good chance to win against a relative unknown, and a shot at a record. The other would finish third, but still collect $175,000 for his efforts. And no matter what, Steve Zoine would finish the day happy as a clam. 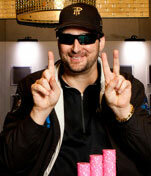 The flop came down 4s-2s-2c, and now Cloutier was about a three-to-one favorite to win the pot. The turn was the Jd, and Bono needed one of six remaining cards — three aces and three kings — to win. (He was now slightly over a six-to-one underdog, 37 cards to 6 cards.) When the 10c fell on the river, Cloutier scooped the million-dollar pot. This left him roughly even in chips against Zoine, and about 45 minutes later T. J. claimed his sixth WSOP bracelet. Cloutier also picked up his 37th WSOP final table (number one, all time; Men “The Master” Nguyen and I both have over 30), his 46th “cash” (fourth place; I’m number one with 48), second place on the WSOP all-time money list with $3.7 million, and another occasion for a loud roar from an old lion, to be witnessed by the world on ESPN in August.